NOTE ~ As mentioned, the format for Mystic Mondays has changed from a multi card reading to a more simple and pointed message of one card. The multiple card readings can now be found in The Mystic Muse monthly newsletter. 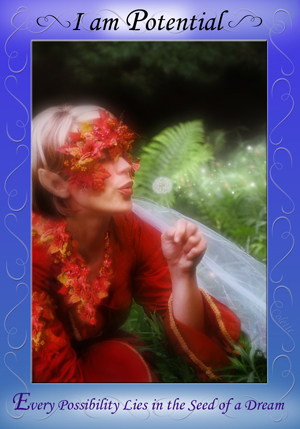 The single card posts each Monday will feature an excerpt from the Mystic Bliss, A Gentle Reminder guidebook as well as a small elaboration on it specifically for that week. ~ Breathe out with confidence in speaking the dream that is yours. The air movement of announcing your intent is similar to the gentle breeze that disperses the seeds in nature. As with the dandelion seed, when carried on light winds seeking fertile soil and exploding into renewed life upon reaching it, so it is with your ambitions and dreams and goals. Be prepared to be special and to have others remember. You have the potential to influence others no matter if you choose to influence the positive or the negative… which of these would you prefer to influence? Insights ~ One of the things I seem to find prevalent for many people is the misconception that their potential is limited by their situation. I know I sometimes forget my unlimited-ness because of conditioning and, at times, situations or results in my life. This is part of being human it seems. Yet this is not a truth. The truth is that we are limitless because we are potential embodied. The only thing holding us back is trust in the dreams that motivate us and the desires that drive us forward. There is not a single person out there that I have encountered to date that has not told me they had an unfulfilled dream or another no matter how successful they are in the eyes of the casual observer. At all stages of our lives we are faced with at least one person looking at what we are attempting to do telling us why it is not possible. I have come to understand that the reason they see things that way is at least some how contaminated by the limitations their own fears generate in themselves. Just because someone tells you that something is not possible does not mean you have to believe them. There comes a point in all our lives, several in fact, when we have to choose between imagining the potential within to real our goals and desires or choose to hide behind fear of disappointment in a particular result. Just because you do not complete a task the first time does not mean you have not gained knowledge on getting there another time. The true test of reaching your full potential is whether you try or not. This week, look at your shelved goals and dreams and dust one of them off. Maybe it is time you tended that delicate seed into something grand.